A glass urn with yellow Mokara orchids in a cascading design along with deep burgundy calla lilies accented with bamboo, sculpted tea leaves and red grapes. 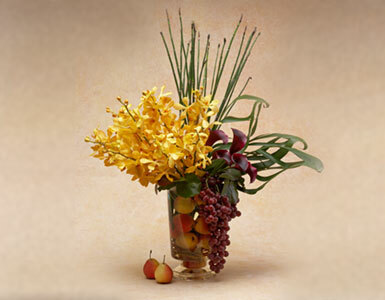 We specialize in Monkara orchid arrangements, Calla lily arrangements and yellow orchid displays. We guarantee prompt vase of orchids delivery in Beverly Hills, West Hollywood, Santa Monica and greater Los Angeles area.